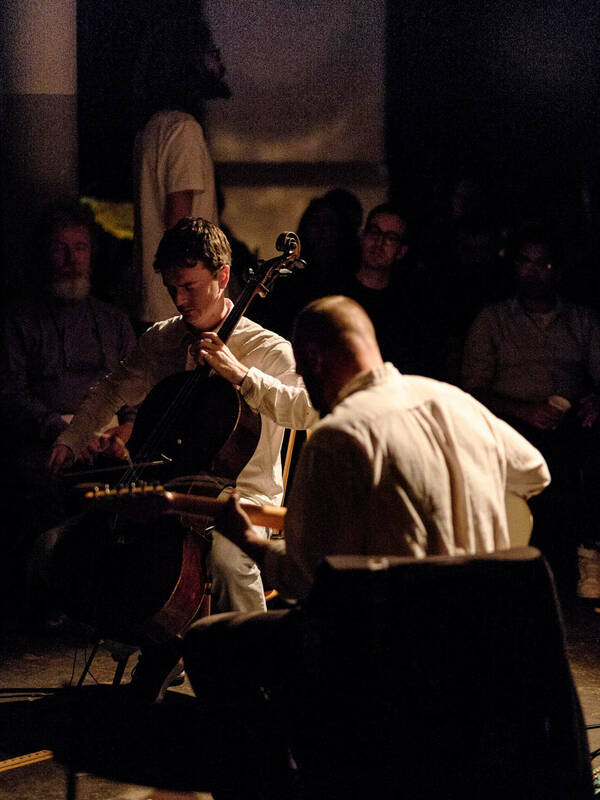 I have long wanted to visit Cafe Oto in Dalston, and the opening of Kammer Klang's 2016/17 season provided a perfect reason. Kammer Klang present a series of curated programmes of contemporary classical, experimental, improvised and electronic music and for last night's event (Tuesday 4 October 2016) we heard sets by Martyna Poznańska, Distractfold (Rocío Bolaños, clarinets; Linda Jankowska, violin; Emma Richards, viola; Alice Purton, cello; Daniel Brew, electric guitar; Mauricio Pauly, artistic co-director; Sam Salem, artistic co-director; Constantin Popp, technical director) and Miles Cooper Seaton & ensemble (Maïa Barouh, Ross Blake, Katie Buckett, Amelinda Burich, Alessandro Cau, Oliver Coates, Cathy Lucas, Tobia Poltronieri and Laetitia Sadier). The result was an evening of impressively contrasted performances, played to a packed house. 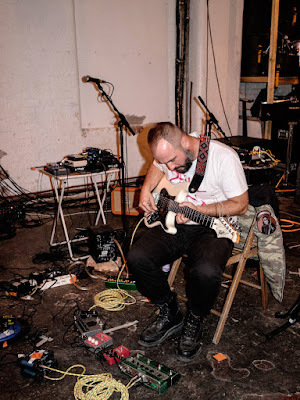 Cafe Oto presents experimental music in a casual, cafe atmosphere, but thankfully there was nothing casual about the audience's attention. Though they were both standing and sitting, the listeners paid eager attention to the music of the three sets, showing a discerning ability to focus. The music was highly contrasted, with Poznańska providing a video and soundtrack based on found sound, Distractfold performing at the cross section between live performance and electronics, whilst Miles Cooper Seaston's Transient Music #2, on the cusp of ambient and minimalism, was almost a communal meditative experience. 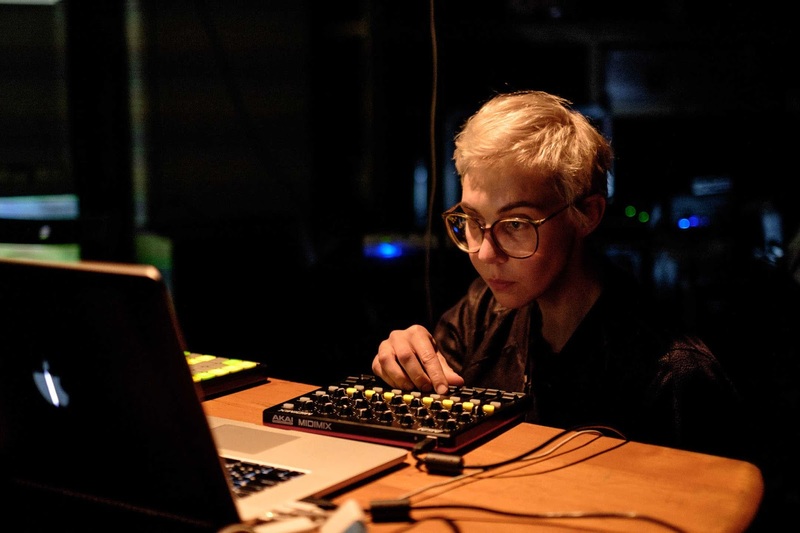 Martyna Poznańska is a cross-disciplinary artist based in Berlin, and her opening set had a video projection which combined with sound track of found sounds to evoke a train journey through city life. The video, with three different strips, presented different aspects of journeying; I was unclear whether projecting it across the stage setup for Distractfold ensemble was a deliberate ploy to partially obscure the imagery or simply a necessity. But the result was striking nonetheless. 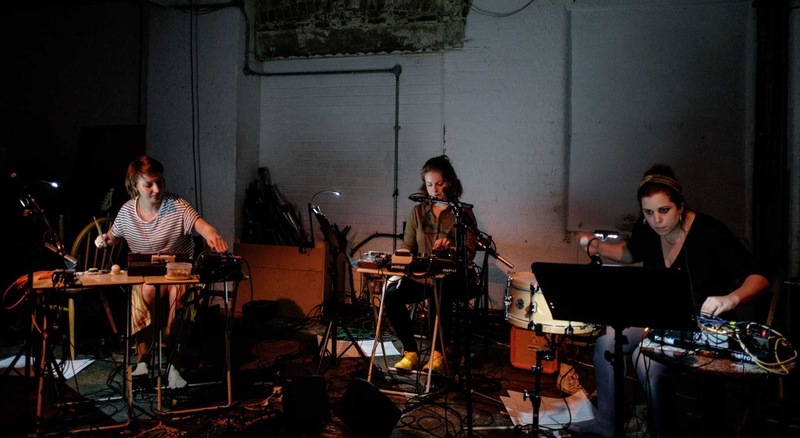 The Manchester-born Distractfold performed three works, each for a different set-up which gave us a fine sampling of the performers range but seemed a little extravagant for a single set. First we heard the UK premiere of Untitled Valley of Fear by Sam Salem, co-artistic director of the ensemble, his 2016 work for three object operators, tape and video. The objects were a fascinating mix of practical and electronics, involving a snare drum, a violin bow and much else besides. So fascinating was the process of watching the three women performing with their array of objects, that the accompanying video of a varied city scape felt rather redundant. The performers played from parts, whatever element of improvisation was in the piece was written in. The piece was a carefully planned array of textures and sounds, mainly an exploration of the quiet, the rough and the scratchy. Though there were noisy moments, it was the complex web of quiet sounds which impressed. Next came Australian composer Liza Lim's 1996 piece Inguz (Fertility) for clarinet and violoncello. Despite using no electronics, this piece was also very much about texture. The two instruments creating highly textural lines with much glissando and swooping, which intertwined. There was plenty of complex detailing, and some impressive playing with the whole ending rather delicately. Finally came the UK premiere of Charred Edifice Shining by Mauricio Pauly, co-artistic director of the ensemble. The 2016 work was written for amplified string trio, with the three performers also controlling their own electronics so that the performance was as much about the live electronics as it was about the string trio. Though an exploration of texture, this was again played from a notated score. Starting from dark atmospherics, the piece explored textures which were edgy and eerie, with many knife-edge (and finger nail on blackboard) moments. As the piece developed, we had moments of violence and high anxiety, but ultimately I found that Pauly's piece rather outstayed its welcome as he seemed to be unable to go beyond a fascinating for extremes of texture, outstretching the material, but clearly the performers found it a deeply intense experience. After the interval, things were re-set for Miles Cooper Seaton and ensemble, giving us the UK premiere of his Transient Music #2. The ensemble consisted of a group of performers, trombone, violin, flute, clarinet and voices who stood surrounding the seated Miles Cooper Seaton (with electronic box of tricks and electric guitar) and the cellist. The music was played without score and I have to confess that I have no idea how the music was controlled. Whilst you could call Cooper Seaton's style minimal, in this piece he was far closer to trance and ambient music. From his introductory talk it is clear that Cooper Seaton is as much interested in the communal experience as the actual notes played, and there was something slightly religious about the intensity of the performers. We started with a low electronic drone and this was joined by the cello and gradually by other instruments and voices. The sense of the drone never varied, and at first evoked naughty thoughts of the opening of Wagner's Das Rheingold, endlessly waiting for the horns to come in. Though the music did develop some interesting textural details, it was very much about being part of the communal experience and the standing performers wandered around the listeners. This was very much music as a meditative communal experience.